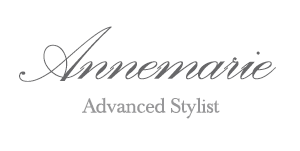 Annemarie is a vibrant stylist from New Jersey. In 2008, she earned her license through Monmouth County's Vocational program and graduated high school. Upon graduation, she moved to Charlotte, NC where she built her life immersed in the beauty industry at X-S Hair Salon Ltd. She also acquired her bachelor's degree in communication at UNC Charlotte. Today, Annemarie utilizes her communication degree by conducting thorough consultations - assuring she is on the same page with each client - so she can create the most appropriate style for the individual's needs. "My goal is to improve everyone's relationship with their hair." In her 5 years of hair styling, Annemarie has honed-in on which services she is passionate about. They include special event styles and up-dos, blow-outs, total redesigning, educating clients, providing style tips, men's cutting and styling, women's color/cutting/styling, highlighting, mbre, fashion coloring and trend research. "The biggest reward is watching polished confident clients walk out our door and ready to take on the world!"